Are America’s Best Years of Innovation Over? According to economist Robert Gordon, today’s innovations might dazzle, but they don’t transform everyday lives in the way that the internal combustion engine, the refrigerator, air conditioning and the elevator transformed the fabric of America from 1870 to 1970. This article reviews Gordon’s new book The Rise and Fall of American Growth: The U.S. Standard of Living Since the Civil War, which explores a time period that he says included unprecedented advances in productivity and quality of life that are unlikely to be repeated. In 1970 Alvin Toffler published Future Shock, a book about a “fire storm of change” sweeping Western industrialized society with “waves of ever accelerating speed and unprecedented impact.” In this and subsequent books, he writes breathlessly about the “quantum leaps” of innovation and transformation we should all brace ourselves for; and a substantial cottage industry of futurist writers continues that tradition. Prominent among them is the MIT-trained author and scientist Ray Kurzweil, who posits a “law of accelerating returns” in information-related technology and has most recently written about a union of human and machine he calls The Singularity. Economist Robert Gordon proposes we view 1970 as a time when change in fact began to slow down, to decelerate. He has for years expressed skepticism at the speculations of those he calls “techno-optimists.” It’s not that he dismisses today’s technological innovations as unimpressive or unimportant. But however much they might dazzle, they don’t transform everyday lives in the way that, say, the internal combustion engine, the refrigerator, and the elevator transformed the fabric of post-Civil War America. His new book, The Rise and Fall of American Growth, is a deep dive into the past with an eye to the future. His central questions are: How and when did American productivity and standard of life experience such profound gains in the last century and a half? And what does that tell us about prospects for the future? One of the things that inspired him to try to capture the tedium, drudgery and danger of nineteenth century life in the United States was a book he stumbled on called The Bad Old Days: They Really Were Terrible. In 1869, a ceremonial golden spike was driven in Utah to create the first transcontinental railroad, symbolically ushering in a new era of modernity. Many of the inventions and innovations that would transform daily life were only a decade or two away. Yet that was no comfort to the men, women and children who endured a standard of living primitive by contemporary standards. Louis Pasteur was only just beginning to develop his germ theory of disease, and a staggering number of children died during their first year. Industrial accidents were common, life expectancy was a mere 45 years, and (for reasons not entirely understood) the average height of native-born American males actually declined almost two inches from 1830 to 1890. Edison didn’t demonstrate his first electric light bulb until 1879, so homes were lit with candles and kerosene lamps, creating indoor pollution and considerable hazard — thousands died every year from lamp accidents. In the absence of plumbing, toting water for washing and cooking was a time-consuming and laborious task. The closing decades of the nineteenth century produced a series of innovations that would completely transform American life. Foremost amongst these was electricity, and the refinement of the internal combustion engine. It took a while for both to become economically viable and widespread, and Gordon points to the years from 1910 to 1940 as the most intensive period of change. Some might wax nostalgic about the horse and buggy days, but the use of horses for urban transportation created serious health problems — generating five to ten tons of manure per square mile. Cars and electric street cars changed all that, and allowed for a different type of urban development. Electricity remade the urban household, powered industry, and, through the elevator, enabled buildings to extend vertically, changing the very nature of land use and creating the urban density we take for granted today. In 1900, 35% of the population still lived on farms, and the transformation of rural America was slower in some ways, but no less fundamental. Life in the farmhouse may not have been radically altered, but the nature of work was. Over a period of just 15 years, U.S. farms were equipped with 370,000 trucks, 450,000 tractors, and over 4 million automobiles. In Iowa, 93% of farmers owned cars by 1926, a higher rate than in cities. Home life in America was “revolutionized” and productivity in the workplace “exploded.” Yet the most profound progress made during this period may have been in the form of reduced mortality rates, especially among infants. In the first half of the twentieth century, life expectancy improved at an annual rate twice as high as in the last half. Although medical care did witness important improvements, this startling progress was due more to environmental changes brought about by electricity, indoor plumbing and running water. One of the book’s ongoing projects is the challenge of quantifying the progress of The Great Leap Forward in fresh ways, and of capturing that which can’t be quantified. A key measure in Gordon’s argument is Total Factor Productivity (TFP) — a tricky one in that it is not so much measured as inferred. It is the X-factor or residual that remains when total economic output is divided by a weighted combination of labor and capital inputs. (It is credited to economist Robert Solow, and thus sometimes referred to as “Solow’s residual.”) It is in essence a kind of catch-all for intangibles driving economic growth — including technology, innovation and knowledge. Because TFP comprises factors that cannot be quantified individually, it has been the subject of some criticism and debate. By this measure and others, the second half of the “special century” (the years from 1920 to 1970) is when American productivity really took off. In the decades before 1920, output per hour increased at a mere 1.5%, then nearly doubled over the course of the next half-century — only to fall back to 1.62% in the years after 1970. This surge is almost entirely due to a growth in TFP is almost triple that of the decades preceding or following this pivotal 50-year interval. Some dimensions of progress are even more difficult to quantify. The growth to which the title refers is really two separate things: increases in productivity and in the standard of living. GDP per capita is the standard measure of progress in the latter, and tripled in the years from 1870 to 1940—but Gordon contends it fails to capture the full scope of gains in people’s everyday lives. Here, he draws on the insights of Gary Becker and others in the school of New Home Economics, which seeks to complement objective measures of consumption with other more subjective measures in order to paint a more complete picture of overall household welfare. Becker pays particular attention to time allocated to non-work activity, an area in which women’s lives were radically transformed during this period. “The life of a working-class housewife in the last nineteenth century was little different than that of a hired domestic servant,” Gordon writes. The time saved and burden eased by running water alone was substantial. Electric sewing machines and the availability of ready-made clothing at affordable prices freed women from another time-consuming task. Other quality of life gains during this period include a decline in the unpleasantness of work (what economists call work “disutility”), the freedom of youth to go to school and recreate instead of working, and the modern invention of the notion of retirement. Last, but certainly not least, are the individual and societal benefits of improved life expectancy, in the first half of the twentieth century due largely to a steep drop in infant mortality rates. The rate in 1880 (215 per 1000 births) had held steady for hundreds of years—but then fell to 27 by 1950. This “historic decline,” Gordon asserts, “is one of the most important single facts in the history of American economic growth.” Because this progress is not reflected in GDP per capita, the economist William Nordhaus calculated a modified GDP growth rate incorporating this additional “health capital.” His “health-augmented” growth rate for the first half of the twentieth century is 4.2%, more than double the conventional measure of 2.05%. Another critical engine of progress during this period was the twin impact of the Great Depression (which set the economy back but also triggered essential reform) followed by the economic pressure cooker of World War II. Huge gains in educational attainment, with a big push from the GI Bill, improved the quality of labor. In part due to the growing strength of unions, that labor was rewarded with high wages and lower hours. In response, capital inputs increased not only in quantity, but in quality. Gordon cites the work of John Kendrick, a pioneer in the field of productivity measurement, who found that one measure of the productivity of capital, the ratio of output to capital input, nearly doubled between the 1920s and the 1950s. Despite this progress, the beginnings of a slowdown, of a shift from revolution to evolution, were in place. Again, progress in the post-War decades reflected a continuation of earlier gains. In a sense, the economy was in the final stages of extracting what it could from the second industrial revolution; the subsequent third industrial revolution would not be nearly so broad or deep in its impact. Gordon also notes a leveling off of inventions and patents in the 1920s, and a sharp drop in the 1940s and 1950s, as innovation moved from the individual entrepreneur/inventor to the corporate R&D office. Finally, progress in public health shifted from a focus on curing infectious diseases (and huge consequent reductions in infant mortality) to a focus on managing chronic disease (with more modest gains for older adults). The drop-off in growth following the “special century” running from 1870 to 1970 is striking by any number of measures. TFP – which rose steadily in the 1920s, 1930s and 1940s, and peaked at nearly 3.5% in the 1950s – fell off in the 1960s and 1970s, and then plummeted in the 1980s. Overall, in the period after 1970, TFP has been a third its rate from 1920 to 1970. Two other measures – output per person and output per hour – also fell back to pre-1920 growth rates. Manufacturing capacity and net investment have also generally been down. Progress in other areas plateaued. Advances in educational attainment slowed, and medicine witnessed “piecemeal improvements” as compared to the “quantum leaps” of earlier decades. In both education and health care, rising costs represented a drag on net gains in standard of living, and exacerbated a growing economic inequality that Gordon argues has emerged as a major threat to future growth. One of the puzzles of the post-1970 slowdown was why the remarkable innovations of the third industrial revolution – even granted their more narrow economic base in the ICT sector – failed to generate measurable gains in productivity. (As Robert Solow quipped, “You can see the computer age everywhere but in the productivity statistics.”) This so-called “modern productivity paradox” was the topic of a 1990 paper by Paul David in which he suggested that a certain gestation period frequently intervenes between an invention and its productivity payoff. There were several decades of lag time between Edison’s first light bulb in 1879 and the productivity growth of the 1920s due to electric manufacturing. The same lag, he argued, was likely happening with the recent quantum leaps in computing. Looking forward, Gordon sees a number of reasons for viewing this temporary lift as an exception that proves the rule. The decade that has followed, 2004–2014, has witnessed the slowest productivity growth of any decade in American history. The price to performance ratio in ICT, after a brief and sharp drop, has flattened out. After its brief surge, the ratio of net investment to capital stock has returned to negative territory. Especially troubling, he writes, is the decline of “business dynamism” as measured by rates of new firm entry vs. old firm exit. The Rise and Fall of America Growth is part of a fascinating debate about future prospects for the American economy. Interestingly, a prominent voice on the other side of the debate is Joel Mokyr, Gordon’s colleague at Northwestern University, where the two are affectionately known as a kind of “economic odd couple” and are frequently paired in public speaking engagements. Gordon bases his own somber predictions on the premise that coming decades are more likely to resemble 2004-2014 than 1994-2004. Whatever innovations are in store in ICT, the preponderance of the American economy is unlikely to be significantly affected. Those anticipating revolutionary change in the near future, he contends, confuse the pace of innovation with its impact. Economist Robert Gordon, Ph.D., writes that the U.S. standard of living is waning not waxing. Dr. Gordon first describes how our historic hazards of candles, rudimentary machinery (industrial accidents), air and water pollution, and medical ignorance (infant mortality) limited our life quality and expectancy, key elements of our standard of living. He next discusses the quality of our lives before the “special century,” 1870 to 1970. Here, Dr. Gordon posits our standard of living was deplorable due to the time-consuming and laborious tasks of everyday life and work. People were burdened with physical demands: Toting water; carrying wood, coal and ice (no refrigerators), and manually cleaning to maintain their homes. Without elevators, we had to climb stairs. Time at work often exceeded 40 hours a week and the physical labor required was arduous, exhausting, taxing, etc. According to the writer, the special century produced a revolution, an “explosion,” in quality of life improvements. Domestic and business labor-saving devices and systems were developed, making life safer and more comfortable. Life expectancy surged. Work was less unpleasant. Following the special century, though, the writer claims America stagnated. 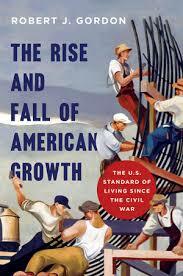 This deceleration in quality of life developments accounts for the “Fall of American Growth” in his book’s title. Worse, the writer opines, it is unlikely we will ever see again a standard of living change of such breadth and depth. Dr. Gordon is not so much in error as unwilling to recognize the value and importance of developments since 1970. First, it is essential to acknowledge the quality of life improvements cited by Dr. Gordon relate nearly exclusively to physical elements. That is, most of the advances of the special century were mechanical – reducing physical labor – benefiting our muscles. Improving healthcare and reducing premature death benefited our physical bodies. The developments since 1970, however, are not about the mechanical; they are about information. The benefits of expanding information, knowledge, and its availability far exceed the value of labor-saving innovations and physical “creature-comforts.” In fact, the special century inventions celebrated by Dr. Gordon depended on expanding information and availability. The industrial revolution did not accurately begin with James Watt’s 18th century engine; it began with Johannes Gutenberg’s printing press in the 15th century. This press standardized the platform for the easy capture and distribution of information. The resulting packets of information, books, delivered the knowledge needed by the builders of the industrial revolution. Books gave us the ability to produce artificial light, efficient energy, safer machinery, the awareness of and efforts to correct pollution, medical progress and more of the quality of life advances recognized by Dr. Gordon. But information is nearly invisible to those observing human behavior and its expressions. At just the time Dr. Gordon claims America’s “growth” slowed, the opposite began. In 1971, Intel developed the first commercial microprocessor. As one looks at the stages of human communication, this was the latest: First, the invention of language; second, the printing press and, now, the personal computer. Many people, including Dr. Gordon, fail to realize the impact on information quality and availability produced by the personal computers and related technology. In fact, many of these people consider only the technology and disparage it. Dr. Gordon discounts “techno-optimists,” asserting their equipment does not transform everyday lives, like a refrigerator. It is my opinion the transformation of the quality of our lives through “pushing information” – at light speed, to everyone, everywhere – will far exceed all that has gone before. Economist Krugman lamented the post-1970 information-explosion era as one of technological disappointment. Economist Gordon attempts but cannot find an economic “productivity gain” through this period of developing information and communication technology. It is not the technology. It is not the productivity. The growth occurring, almost invisibly, is information. And the results may not be measurable as productivity. A leading business thinker of the 20th century, Dr. Peter F. Drucker, described in his 1985 book “Innovation and Entrepreneurship,” a typical 25-year delay between innovation and apparent results, such as commercial applications. Our world-wide electronic inventory of information shared by more than 3 billion people, the modern Internet, is less than 25 years old. Economic statistics may not reflect the value of this information in productivity yet, although the information-dependant financial and insurance industries have been making increasing contributions to the US GDP. The prescient Dr. Drucker saw the difference between improving physical tools, machines and appliances, and widening the dissemination of ever-improving information. He saw that the model of technology during the 300 years after the start of the Industrial Revolution was mechanical. Advances were measured in mechanical processes such as more speed, higher temperatures (or lower, as in air-conditioning), cleaner water, controlled quality, etc. Can Dr. Gordon discover evidence that our quality of life is being improved by personal or commercial processes organized around information? Do we do things differently today because we have so much information available through the Internet and smart phones? Have organizations applied information to substantially improve practices and procedures since 1970? I would argue they have. I would also advise Dr. Gordon not to look for quality of life indicators among business statistics, productivity or gross domestic product. Study youngsters. The life of a youth today is so much better than in 1970. A teen with a smartphone, for example, is in constant touch with family and friends. A student has at his or her fingertips access to any information, in an appropriate medium (e.g. video), deemed necessary for learning, entertainment, exploring, etc. Dr. Gordon celebrates 1970 as the apogee of the rise of American growth and standard of living. Looking back, I see 1970 as the dark ages. Television choices were very limited without cable. A lack of satellites allowed weather surprises. It was rare to enjoy the convenience provided by microwave ovens or even credit cards. Film was required to take pictures. Documents were prepared with typewriters. Without portable cassette, CD or MP3 players, music was not mobile. Synchronized wristwatches did not exist and, without GPS, I could not know precisely what time it was or where I was. If I was lost or stranded I could not use a handheld mobile cell phone. A monopoly controlled all (limited capability) telephone equipment. Calling 911 for help was not yet possible. 1970s represents just another year in the never-ending advancement of humans.